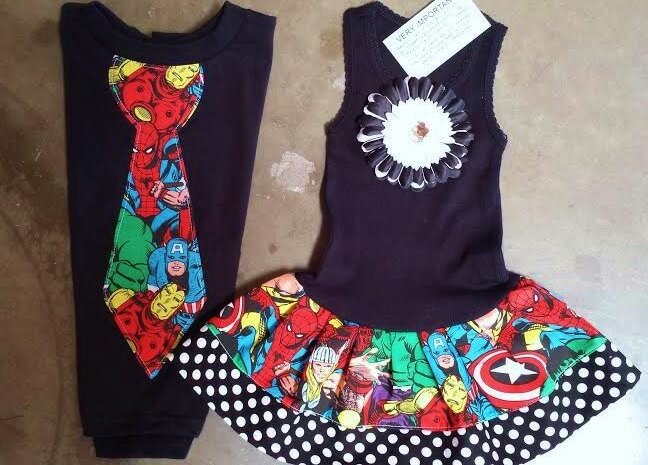 Avengers, Super Hero, Sibling Set. Tank Style Dresses run very true to size. The tanks are ribbed so they will stretch or conform to the shape of your child. Flower on dress is a pin. If not desired, I can do a fabric applique of super hero fabric at no additional cost. Ordered this for my Son's 1st Birthday and love the set!! Got just in time for pictures too! This is the second product/order I have placed with this shop and have never been let down on any part of the transaction! Thank You so Much! Good quality and just as pictured. Would order again from this shop. They are so cute. Got them in the Mail pretty fast. Even got my daughter a matching bow. Can't wait to put these in my kids in april for my sons birthday party. Amazing! Absolutely the perfect addition to my son's birthday party!